RENO, Nev. (AP) -- It's not official yet, but all those orange-clad fans flowing onto the Mackay Stadium turf told the story: Boise State is BCS bound. Ian Johnson ran for 147 yards and three touchdowns and Jared Zabransky passed for 299 yards to lead Boise State to a 38-7 win over Nevada on Saturday, wrapped up a spot in the Bowl Championship Series for the unbeaten Broncos. Zabransky completed 20-of-27 passes, including a 45-yard TD to Legedu Naanee for the Broncos (12-0, 8-0 in the Western Athletic Conference), who are 39-1 in the WAC since 2002 and have won at least a share of the league title five years in a row. "This is the most dominant team in WAC history," conference commissioner Karl Benson told the Broncos after the game. They entered the day 11th in the BCS standings and have to finish No. 12 or better to automatically qualify for one of the big-money bowls. They will become only the second team from a non-BCS league to play in the BCS after Utah reached the 2004 Fiesta Bowl out of the Mountain West Conference. The BCS bids go out Dec. 3. Expect Boise State to get an invite to the Fiesta Bowl to face the Big 12 champion. Officials from the Fiesta and Orange bowls watched Saturday's game from the press box. "This team is worthy of a BCS bowl," Fiesta Bowl president John Junker told the Broncos in the locker room afterward. "You'll have to wait a week, but we'll be getting ready for you in the Valley of the Sun." About 4,000 orange-and-blue clad Bronco fans who made the trip from Boise rushed the field after the final gun, waving flags and banners and crowding around the team. "This means everything on our pyramid is done," Johnson said. "We've had so many goals and we've knocked off every one." Nevada (8-4, 5-3) entered the game leading the nation with a turnover margin of plus 15, but lost three fumbles in the first 24 minutes of the game -- four on the game -- and fell behind 17-0 at the half. Naanee caught seven passes for 129 yards for the Broncos, who snapped Nevada's 10-game home winning streak and claimed their seventh consecutive victory over the Wolf Pack before a crowd of 25,506, the 10th largest in Mackay Stadium history. Nevada coach Chris Ault said he was "extremely disappointed" in his offense but that much of the credit went to the Broncos. "My hat goes off to them. I hope they go to the Fiesta Bowl and we'll be watching them," Ault said. "Our defense played hard until the fourth quarter, there's only so much a defense can do." You just cannot ask to the defense to win the football game," he said. Johnson, a sophomore who wore a flak jacket under his pads to protect a pair of cracked ribs, ran 31 times and set the school single-season record with 1,613 yards rushing. He broke the old mark of 1,611 set by Brock Forsey in 2002. He entered the day leading the nation in scoring, and now has 24 TDs. "I got out there and forgot about the ribs," Johnson said. "I've played with broken ribs before... I just wanted to play hard for the team." Robert Hubbard had 105 yards rushing for Nevada but Jeff Rowe was only 6-for-15 for 35 yards. "The offense didn't score one point. The responsibility is on me," Rowe said. "They are a really good team and deserve everything they are going to get." The Wolf Pack had only four first downs. "I don't think I've seen them dominate like they did today," Boise State coach Chris Petersen said about his defense. "Not in my wildest dreams did I think they would shut them down like that." Bronco defensive tackle Andrew Browning had seven tackles, including three sacks, and linebacker Korey Hall also had seven tackles. Despite the loss, Nevada appears headed to one of the three bowls -- the MPC Computers, Sheraton Hawaii Bowl or New Mexico. Leading 17-0 at the half, Boise State opened the third quarter with an 80-yard touchdown drive, including 48 yards on six carries by Johnson and wide receiver Vinny Perretta's 5-yard score off a direct snap. The Broncos fans broke into a chant of "BCS, BCS" as Anthony Montgomery converted the extra point for a 24-0 lead at 10:13. Four minutes later, Zabransky threw a 45-yard touchdown pass to Naanee to push the lead to 31-0. Nevada's only points came when Nick Hawthrone intercepted a screen pass and returned it 45 yards for a touchdown in the third quarter to keep alive the Wolf Pack's streak of 316 games without being shutout, the longest in NCAA Division I. "This is overwhelming," Hall said. "I couldn't' have pictured myself in this situation five years ago. We're now 12-0 and about to go to the Fiesta Bowl." This was almost the same pasting USC gave Notre Dame when Tyrone Willingham was coaching them. LOS ANGELES (AP) -- Too much speed, too much defense, and too much Dwayne Jarrett. With all that, Southern California didn't need last-second heroics to beat Notre Dame this year. John David Booty passed for 265 yards and three touchdowns to Jarrett as USC overpowered the sixth-ranked Fighting Irish 44-24 Saturday night and likely leapfrogged Michigan in the race for the national championship. No. 3 USC contained Brady Quinn, the Irish's Heisman Trophy contender, and put together a performance that should boost its Bowl Championship Series standing. The Trojans were a close third behind the Wolverines last week. "I think we're a pretty good team right now," USC coach Pete Carroll said. "We'll play anybody, any where." Should the Trojans (10-1) beat UCLA (6-5) at the Rose Bowl next weekend, they'll probably face top-ranked Ohio State in the BCS title game Jan. 8 in Glendale, Ariz. USC has beaten its crosstown rivals seven straight times. And now the Trojans have won five straight against Notre Dame (10-2). The Trojans played in the BCS title game the past two years -- winning one and losing one -- and earned a piece of the national championship three years ago after being bypassed for the title game. "It was really a fun night of football," Carroll said. "For the most part, we felt in command in the game. The offense was ripping, it was just an extraordinary night for Dwayne Jarrett. He made the plays great players make." Booty, who completed 17-of-28 passes and was intercepted twice, watched from the sideline when the Trojans beat the Irish 34-31 at Notre Dame last year on Matt Leinart's 1-yard sneak with three seconds remaining. Jarrett, whose 61-yard reception on a fourth-and-9 play kept that final drive in South Bend alive, caught scoring passes of 9, 5 and 43 yards from Booty, who succeeded Leinart as USC's quarterback. The 43-yarder came with 8:21 remaining and gave the Trojans a 37-17 lead. Jarrett finished with seven receptions for 132 yards and USC freshman C.J. Gable rushed for 107 yards on 20 carries. "I've seen him do that time and time again -- all the time," Booty said of Jarrett. "To me, it's not surprising at all. I'm just glad I have him on my team." USC lost 33-31 at Oregon State on Oct. 28. Since then, they've outscored the opposition 144-43. "I think it was kind of good for us in a way, it was kind of a wake-up call," Jarrett said of the loss. "We're so used to winning. It was a reality check for us, just to get our act together." Quinn threw a 2-yard scoring pass to Jeff Samardzija with 3:39 left, but Brian Cushing returned the ensuing onside kickoff 42 yards to put an exclamation point on the victory. "I told myself that if they kicked it to me, I'd take it in myself," Cushing said. Quinn, playing his final regular-season game, completed 22 of 45 passes for 274 yards and three touchdowns with no interceptions. He also rushed for 74 yards -- most of it on a 60-yard scramble in the second quarter. Rhema McKnight caught six passes for 109 yards and one touchdown and Jeff Samardzija had six receptions for 79 yards and one TD. The three Notre Dame stars -- all seniors -- leave school having never beaten USC. "This teams plays off one another. The offense just didn't do our part tonight," Quinn said. "We didn't make big plays when we needed to. It was frustrating at times. I'd try to find someone open, and there wasn't anyone there." The win before a crowd of 91,800 at the Los Angeles Coliseum was the Trojans 55th in their last 58 games. They're 20-0 in November games under Carroll, and have won 33 straight home games. The loss snapped an eight-game winning streak for Notre Dame, but the Irish still figure to play in a big-money bowl game. "We didn't win on special teams. We didn't win on offense. We didn't win on defense," Irish coach Charlie Weis said. "We're fighting an uphill battle most of the night. It wasn't very productive." The Trojans moved 65 yards with the second half kickoff, scoring on a 2-yard run by Chauncey Washington for a 28-10 lead. Jarrett's one-handed catch for a 19 yards set up the score. "I just stuck my hand out there and I just grabbed it," Jarrett said. "It's nothing new. It's just me being me, going out there and making plays." The Irish drew within 11 points late in the third period on a 2-yard pass from Quinn to McKnight on fourth-and-goal. It was McKnight's 15th touchdown reception this season, tying the school record set by Samarzdija last season. The Trojans extended their lead to 31-17 on Mario Danelo's 34-yard field goal early in the fourth quarter. USC scored on its first three possessions and led 21-10 at halftime. It might have been closer had the Irish not failed to convert three fourth-down plays in USC territory. Quinn threw a 38-yard pass to McKnight on the game's first play, but Quinn's pass to McKnight on fourth-and-9 from the USC 29 was incomplete. The Trojans then moved 71 yards, scoring on a 9-yard pass from Booty to Jarrett. USC forced a punt, and Desmond Reed, who tore up his knee in last year's game at Notre Dame, returned it 43 yards to the Irish 26. Booty threw a 5-yard TD pass to Jarrett three plays later. Notre Dame's Carl Gioia kicked a 27-yard field goal, but Booty's 1-yard run capped a 59-yard drive, putting the Trojans ahead 21-3. That made it an NCAA-record 63 straight games in which USC has scored 20 or more points. The Trojans' next three possessions were as negative as the first three were positive -- a blocked punt and two interceptions. Quinn threw a 7-yard touchdown pass to Marcus Freeman on the first play after Steve Quinn blocked Greg Woidneck's punt. Notre Dame leads the series 42-31-5. TALLAHASSEE, Fla. (AP) -- Florida coach Urban Meyer sure knows how to win rivalry games. Florida (11-1) won its third straight against Florida State and improved to 6-0 against its three main rivals -- Tennessee, Georgia and Florida State -- in Meyer's two seasons. The latest victory might not help much in the Bowl Championship Series standings. The Gators probably still need help to get to the title game. But don't expect Florida to complain. The Gators won consecutive games in Tallahassee for the first time since 1986 and won three in a row against their in-state rivals for the first time since a six-game streak between 1981 and 1986. Leak had a lot to do with the current streak. He completed 21 of 34 passes and directed several long drives Saturday. The most impressive came when Florida needed it most. Leak was 7-of-8 for 81 yards on the game-winning drive early in the fourth quarter. He called an audible on third down, recognizing a blitz and checking to a slant pass, and hooked up with Dallas Baker for a 25-yard gain. He connected with Baker again two plays later for a 25-yard score. The Seminoles (6-6) had two chances to even the score, but they failed to convert on fourth down twice -- once in Florida territory and once deep in their own end. The Gators led 14-0 at halftime -- Andre Caldwell caught a screen pass and turned it into a 66-yard score and Harvin had a 41-yard TD run from the quarterback position. Florida's Chris Hetland missed two short field goals, and is now 3-for-12, prompting many to question why Meyer has stuck with him. The misses almost proved costly, too. Joe Surratt scored from a yard out in the third quarter and the Seminoles tied the game in the fourth on Drew Weatherford's 25-yard TD pass to Greg Carr. But Leak rallied the Gators on the ensuing drive. He improved to 3-1 against Florida State, completing 59 percent of his passes for 1,098 yards, with seven touchdowns and two interceptions. 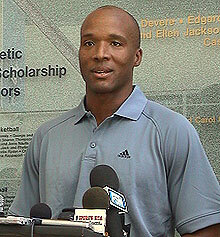 The Gators also overcame the loss of Harvin and running back DeShawn Wynn. Harvin, the team's most dynamic player, was strapped to a backboard and carted off the field in the second quarter. He was hurt while trying to catch a pass across the middle. Harvin's head appeared to hit linebacker Buster Davis' knee. He stayed on the ground for several minutes before team doctors decided to cart him to the locker room. Harvin was moving his arms and legs while on the ground. He held up his left thumb while being driven to the locker room. Team officials said he was walking around at halftime and should be OK.
Wynn injured his left shoulder on the second play of the third quarter and did not return. Florida State's offense was woeful -- again -- for much of the game. Weatherford started and played three series before getting benched in favor of Xavier Lee. Weatherford was 3-of-9 for 46 yards. Lee was even worse in the next three series, completing two of six passes for 8 yards and fumbling a snap. Weatherford returned and was roundly booed, especially after getting sacked and fumbling out of bounds on his first play back. Nonetheless, coach Bobby Bowden stuck with Weatherford in the second half, a questionable decision after he threw interceptions on the first two series of the third quarter. Weatherford was picked off for a third time following Surratt's touchdown, but he rebounded with consecutive passes to Carr to start the fourth. The second one was a jump ball in the end zone that Carr caught over cornerback Reggie Lewis. Weatherford finished 16-of-37 for 181 yards and couldn't complete the comeback. As much as I personally hate this scene, it happened. Arizona beat Cal and ended -- with USC -- our Rose Bowl dreams. Enter for your chance to win a five-thousand dollar scholarship to help pay for school for you or your family from Pontiac. Sorry I'm a little late. I was reading Charlie's press conference quotes (room laughter). I'm sure he was cordial. What a great thing this is--to have a football game of this magnitude and this style and class coming up...two winning football teams, this is really cool. Everything about it is good. We're really pleased with where we are right now and with a chance to play Notre Dame here at the Coliseum, it's just a great opportunity for our guys to be in a big time match-up and have a lot of fun with it and see if we can play another good football game and keep this season going. I feel like we're continuing to grow as a football team. I feel like we're still reaching for our best...we're maturing still. It's interesting that it feels that way because clearly, we're still very young but we're seeing some really mature things happen on the football field as a team. Guys are playing really smart, they're doing things well, they're working hard at it, they're enjoying what they're doing, and they're learning and growing and all of that. I think with that, our confidence has grown in the last month or so and to the point where we're ready for this kind of a matchup coming off the Cal game. I think it's going to be real interesting to see where this one goes. I think it's going to be a fantastic opportunity for our fans to enjoy a last game at the Coliseum this year. It's been a great season for the following...they've been fantastic. The game last week was extraordinary in the way they responded and cheered and went nuts and I'm sure they had a great time, but this is just one more great opportunity. With that, we need to play up so that we're worthy of the moment. And so we're going to work real hard to get that done during this week. So we look, very much, forward to this. It wasn't really a statement of appreciation. It was just the plays in the game that we're going to run and that he was taking part in. I wish I could say that it was gratitude all over but it was really just the plays that we were running and he was part of them. He has plays that he takes part in each week and he continues to grow in the things that he can do and stuff. I really had gone through the week thinking that he would play more than he did. C.J. Gable went crazy in that game and really played well and took some snaps away from some of the other guys. Well, I hope that it can continue. This means a tremendous amount to a team of any sport...that can finish and win at the end of the season when everything is on the line. You play your best and all of that. Anybody that's ever competed would like to say that about your team and you ability to play I think. I'm really, really proud of it. I just wish I knew better when it happens. I wish I could coin it. I don't know--it's just been something that's been part of the nature of this team and I'm thrilled about it and hopefully, we can keep it going. It's only as good as your next game you know. But it has been an outstanding characteristic of our program and I'm real proud of it. I'm loving it and would love to see it happen again. Sometimes, it's a little confusing in my head because the Rose Bowl is like the greatest game you can play in...growing up. So when we had the chance a few years ago to play Michigan in the Rose Bowl and still be playing for the national championship, I don't know if it can get any better than that. Our team, our sights are always set on the Rose Bowl so that's something that we're focused on. We don't have any control other than the ability to win over what's going to happen in the next couple of weeks. So I'm not going to set our sights and our goals in that manner because it's not up to us. It's up to the system to choose us to be in the championship game. If that happens, that happens. If not, we're going to have a great time at the Rose Bowl. Well, I think it's pretty hard to keep us out of it because of the strength of schedule that we've had to play during the season. I think from start to finish, it's been an extraordinary schedule. I don't know if anybody compares to it--you guys would know better than I would. But have never figured it out or added it up. I don't care to but I know it's about as hard as you can get. So if that's the factor, then you know...I don't know what the factors will be otherwise...honestly, I don't know how to figure the thing out. We're going to play these games and at the end of it, we're going to have a chance to have an extraordinary season and if that's worthy of the selection process for the BCS game then we'll pack up and go. That's okay...we would like that. I think it's been a combination. The reason that the maturity has shown up is because we've trusted in them a little bit more and we've allowed them to show who they are and what they are. This is a very physical, tough-minded, hard-nosed group of guys. This whole defense from (defensive coordinator) Nick Holt to the whole staff and everybody in there is just a bunch of hard-knock guys and they like playing in that kind of a mode. We might not have tapped into it well enough earlier in the year the way we have achieved later on. I think it's just kind of come together and it's been really exciting to see it. They're having a blast playing football. Nick is doing a great job leading these guys and all the coaches are doing a terrific job. It's working out like we had hoped. Maybe if we had hoped it one game sooner, you know. Sure. Sure--we're always trying to figure out...and it's a baseline philosophy for us in all phases of our football...we're trying to find things that individual players do in a special manner. Then we try to fit it in and allow them to demonstrate what's unique about their nature and their style and their abilities. It doesn't matter whether a guy is running around or setting up for pass protection or carrying the football. We try to use them in ways that they can best express their ability. I think it took us a while to get the experience behind us and the breadth of stuff from the notebook that we can really start to display and exhibit the true nature that this group has. I think they got a lot of pump early on and I didn't think it was deserving to tell you the truth. We had a lot of attention paid to us early in the year because of the linebackers and all that stuff but I think it is deserving now. I think they're playing great football...and to go week in and week out, it looks pretty much the same. That's the consistency that can win you championships obviously. I can't compare them to anybody. I can't tell you who the linebackers compare to...I don't care to but I do know that these guys are playing really, really good ball. The fact that Lawrence Jackson has elevated now and started to be more active and more productive has really made a difference but it's all these guys. It is Keith Rivers and Brian Cushing and Dallas Sartz and Kevin Ellison and Terrell Thomas. It goes all the way to Sedrick Ellis coming back once he got back. I mean, all of those guys are all playing really good football. What's really exciting is all of those guys...and Oscar Lua is too...but only a couple of those guys are seniors. We have a lot to look forward to. I think we match up alright. We know them; we know their personnel; we know their style some now after a year of playing them and seeing them during the season. We're going to not have any issues that we can't match up I don't think. I think their defensive line is really stout and really good. Victor Abiamiri and Derek Landri are really, really good football players. And these are number one draft pick guys. Those guys can be a factor that can change the game for them but I think we can handle it and we're surely going to try to find out during the week. This week. I didn't look at them other than when we crossed over at Stanford with any earnest other than what we normally do. I don't have that mechanism to do that. I stay with the team that we're playing. You can't help but see highlights. You see highlights on TV at times and you see things happening and stories of the games and things. They've had some extraordinary games you know. I was anxious to see the UCLA film because I had heard about it. I was listening on the radio while I was watching a high school game. I was sitting out in the car trying to keep track so I was interested to know. But I don't go ahead and look at stuff ahead of time. But you can't help but see things when you are crossing over. That's logical and naturally, it happens in that manner. I don't know that he's that much different. I thought he was great last year. I think he's just continued on...probably what generally happens is that he's just minimized the bad plays. Five picks for the year is phenomenal for all the throws that he's had. But I think he captured their system last year and he's just continued to grow. I don't think he's that much different. I think he's a great football player. He might be the best guy in the whole draft coming out. The top guy you can pick because he's got the back run and he's got the stature and he's a tough guy and he's been highly productive. He's done about all you can do. All of the things I just said. He's classic. He's a classic thrower. He's got a strong arm, he's got good feet; he has vision down the field, he's resourceful. He's hard to sack, hard to get down because he's such a good competitor and such a good natural athlete. He shakes guys off and finds a way to make another throw or another play of it when he gets hit in the backfield. He makes good decisions; he plays a high style offense. You can pull out the New England Patriots film and see him make the same kinds of plays that Tom Brady makes...it's the same notebook. He's ready for the next level, as ready as he can get in college. Everything about him is good. He's got good touch and he takes care of the ball and moves well also. He's got all the elements. He's a great quarterback and he's going to be a great long time player in the NFL too. I think it was a pretty special win because of the heroics at the end and the "against all odds" kind of situation with the clock and all. And then it had a little bit of flare to it too. You know, they take the field and it's not over and all that kind of stuff. Plus, you're at Notre Dame and every single person there was screaming at the top of their lungs for them to win on the fourth and nine play. Matt Leinart stepped into that moment and quieted the whole crowd down in his mind and executed perfectly and put us in position for a very heroic win. And he sneaks it in and you know the whole thing. So that stuff is very, very cool and very unique that it happened in that setting. For us, it enabled us to be in the national championship game by winning that game. It's the kind of heroics that happen sometimes when you're very lucky and fortunate and in the right place at the right time. They're the same team. They have all the same guys playing. They are a very senior-laden football team so all those guys played last year. I don't know how they were so fortunate to be so healthy. I mean, they made it through the whole season with almost everybody there. They lost their fullback and their tight-end but for the most part, all those big name guys on both sides of the ball have been there and played really good football and they have had a fantastic season and good fortune. Well, they've got a couple guys you know. Rhema McKnight is a fine football player as well. It's going to be hard. Jeff Samardzija is a great played--he's really fun to watch. This is a classic guy who makes all the plays...makes the big plays. He wins the UCLA game catching and running to do that one...and can make big plays on the football. We're challenged by these guys because you can cover them as we did last year...we're standing right next to them and we're jumping up and they're making the plays so that's an issue for us that we have to deal with. But we're going to try. We always are trying to make somebody beat you the other way...some way other than the way that they'd like to and if we can do that, we will. The last couple weeks, we've been able to do that. We've been able to take the essence of the offense--the things that they want to do out of their game and made them play differently. That's a real good accomplishment when you're playing against Oregon and Cal--great offensive football teams. It's hard to do that but it did happen in those two weeks. If we are so fortunate to do that this week, it would be hard on them. If we could get Samardzija not to have a big game and get running back Darius Walker not to have a big game. I don't know how we're going to slow the quarterback down. I just think he's too good but we'll try to do those things. Well it's all of the rich heritage and the history of the match-ups...the classic arenas to play in and just the cross-country aspect of it too. They bring so much following from the middle of the country and we have tremendous following here and around the country but primarily set in the west. I think all of those things...the great names of the people, the coaches that have been in this rivalry and have accomplished so much through schools and after they've went on. It's just a who's who of college football and tremendous accomplishments. All of those things and the colors look good when you play together...I mean you name it--it's all just very, very rich and very special. (Charlie's) from New Jersey. I was born in San Francisco. I'm damn proud of being born in San Francisco. I just think it's the totally different backgrounds. Totally backgrounds growing up--totally different backgrounds in coaching with different mentors and all that. There's a lot of ways to do it--you don't have to do it the same way. We're totally different in the way we approach our game. 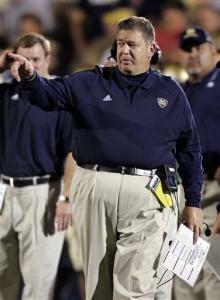 I saw Charlie Weis on TV wearing a coat and tie around campus. I haven't done that very many times since I've been here. There's just a big difference between us but hopefully in the history of our times going against each other in the NFL and all, we've both turned out pretty good and stuff. I think the contrast is obvious and it's broad. I don't know that--to tell you the truth--I really don't know that much about how they do stuff on the inside...how they talk and all that. But I do know that we just come from a different background...kind of a different lineage in coaching and all. Yeah, big Jack (Jack Del Rio, Jacksonville Jaguars head coach) looked pretty sharp. I don't know what that was all about. Yeah I'm thinking about it. Nah--you've got to keep me from putting my sweatshirt on as it is. I think difference is good. They can do it any way they want to and however they see fit. I was asked today on an interview `how are we going to counter the revenge factor'? I don't know. I have no idea how you do that. I don't even want to think about that. To do what we've done over the years, I don't know any other way than to treat every opportunity as a tremendous championship challenge. When you have that mentality, every game is enormous--every game calls for everything you have and that's how we approach every game. To beat Stanford 42-0 was a huge accomplishment for us in the way that we did it and that manner that we accomplished that for a variety of reasons. To win this Cal game and to do what we did to put ourselves in the Rose Bowl--to win a conference championship--it's a huge game but so was the Arkansas game and so was every other one and every game we've ever played. And this is another opportunity--it's got special flavor to it--I'm not going to stand here and play to it like we're going to do things differently. We figured that out and we don't do that. If we do what we always do, it will be good enough and we'll have a chance to win a football game. That's what's more important--I don't want our guys to play harder this week. That's the last thing that I want them to try and do...I want them to play like we always play and if we do that, we win for the most part. To try something in the manner that's outside of what we normally do--that gets us championships and wins games for years and years and years would be a horrendous mistake on our part. We've figured that part of it out and I'm really proud of that. So I don't really play to the alums in the sense that I'm telling them that this is the biggest event in the history of the world. I think it's the greatest football game in America on Saturday and then next week will be that same thing again. That's how we're going to do it. We're going to talk that way and approach it in that manner and I'm not worried one bit about having a championship game last week. This is a championship game this week. We're so lucky that we get to play another one this week. We're going to get up again. We're not going to come out with some other mentality if I can help it. I personally believe yes. That can work against you. I'll give you a great contrast. Now, I don't know this because I didn't hear this and I didn't read it but somebody told me that coach (Ohio State) Jim Tressel said to his team that he wanted them to play better than they are. I don't know that. I want our guys just to play like they do at practice everyday. There's different ways to look at stuff and whatever it takes is okay. However you want to go about it is alright. You just have to find your own way and that's why Charlie Weis and I are totally different. And we have totally different outlooks on some things but when it comes down to football, we want our guys to exactly what we're telling them to do every single play and to execute no matter what the situation or setting is. In his manner, and in our manner, we're both able to do that...we're quite able to do that and totally talk differently and approach differently...different notebooks, different all of that stuff. It's a wonderful part of this game--you can do it in different manners and still get great and similar results. Yeah--the first time we played Notre Dame. We screwed that up. I went right along with exactly like you guys would want me to--talking about all the old guys and all the history and showed them the film and the footage and the whole thing. In my opinion, it had nothing to do with playing that day. That may not have had any bearing on that game, but I'm using it forever that way when I coach. I don't do that anymore. He's going to sit out today at practice but he's going to play in the game. He's going to be alright--we're going to rest him one more day. He's in pretty good shape...much better than he was last week so we're going to rest him one more day. Well, we just had a couple of penalties that offset us. Sometimes those penalties don't even affect us at all but they did. A five-yard penalty messed us up. We missed a touchdown opportunity and then we wound up kicking the field goal so there's four points. A couple of those things happened--we didn't turn the ball over. We didn't make the big mistakes but it just offset our tempo a little bit and we weren't quite as sharp early throwing the ball as we ended up being. So we cut it loose and didn't hold anything back in the second half and weren't worried about what happened in the first half and everything worked out just fine. This is a very, very good football team you know. We were very concerned about their ability to take the ball away from us. They had 20 interceptions coming into our game and so we were very careful to not give them that kind of play that would fuel them, ignite their football team; give them that good old feeling that everything is like it always has been. We shut them out on turnovers by approaching it in that manner and that really was the factor in the game I think. So we just played the game. 9-6 at halftime, I didn't care. It didn't matter. It was what was going to happen at the end that was what was important. We felt like we had figured out what we needed to do and how we could find out ways down the field on offense and stop them on defense. Fortunately, we came out in the second half and shut them out and outscored them 17-0 and won a terrific football game for us. It would be awesome for the Ohio State and Michigan people (laughter) and the Big Ten would love it--cash-in, in a big way. If that happens, that happens. It was a very close football game. Michigan just would not give in to that game. They kept fighting all the way and made it as close just about, as you can make it. Two really good football teams obviously--so it would be a classic if it came out that way. I don't know. I don't know what the impact of that would be. I can't even follow it. Whenever you talk BCS, I get confused. Yeah he was a mess last year and I'm not letting that happen this year. He was crying and all this stuff. He couldn't throw the ball in the friggin ocean for us in the first half. But he finally came back around and played pretty good--he had the teary eyes and all that stuff. I hope it's not like that. We need to be a little more composed than that. But for Matt, I understand it totally. He had put so much into his career here. He had given himself wholly and accomplished so much and everything. He loved it so much, he was going to miss it that much that he couldn't control it in that regard. He'll never have another moment like that. In essence, it was Matt Leinart at his very best. Fortunately, everybody played well around him and we got a nice win but he was a basket case in that first half. Yeah we're still waiting today but it sounds good. Sounds like he's going to practice again today with us and by tonight, we think he's got a great chance to get cleared. He's been practicing for the last couple of weeks...he's ready to go. He's chomping at the bit and we'll certainly play him if he's cleared. They need to talk to him tonight again to make sure everything is absolutely okay. He feels great and he'll be fine. I hope we can get him to practice today so he can get his work and get ready. Well, we'd like to do that. We have never set that as a guideline for us but I'd like for that to happen. We would like to get guys a chance to do something and be a part of it. It's more difficult than you'd think. But we'll see. We'll see if we can do that. I don't think it's just the fact that they play. It would be cool if they did. But our guys have done a tremendous amount in the time they've been here. It was wonderful in the locker room after the game last week to recognize the guys that have been there for five straight championships. It was just a handful of guys but it was special to recognize that that's all they've known. All they've known is championship football. And as they go out, they have accomplished something that hasn't been done before and they'll always be able to carry that with them and take that as they go. This game, the fact that so many of our former players return, and come back and do the tunnel and all that makes it really, really special for these guys. That's really the recognition and the tribute that I think separates this game from another game. I hope everybody can have a chance to play though. It's been nothing short of miraculous. It's been startling to see what he's been able to do with what he's been dealing with right now. None of you would really be able to appreciate unless you saw him with his shoe off and what he deals with. His foot still doesn't work but he's found a way to overcome it and he never ever doubted for a moment that he wouldn't be able to do that. In that, he's been a tremendous inspiration for our football team and for everybody that loves football...that loves SC ball. For him to overcome and be able to play and to get into games at all. I mean, he can get into a uniform and get onto the practice field but he's been able to play and perform and help us and all that so, I'm very excited. I couldn't imagine that he would be able to figure it out or that the doctors would ever let him do it and all of that but he just kind of willed it to happen and just proved it to them. He said come out here and watch me and watch what I can do and after while, they just said, well, let him play. If he can do it, let him go. He's done a remarkable job. He's a great addition with the spirit that he brings and his nature about competing and playing. He's very special to our team. We have our annual toy drive going on at the stadium this weekend--so we'd love for you to help us get the word out. Thousands of kids get presents they wouldn't have received otherwise by the Champs for Children foundation (www.champsforchildren.org). They did a great job--they sent presents to New Orleans and the kids down there and the kids in the area. They did a great job and so we hope that people can bring presents...unwrapped presents. There will be places to deposit them at the Coliseum and it's really a good cause and they did a good job last year so I hope you can support that Saturday night at the game. Irish head coach looks ahead to this weekend's matchup with USC. Q. You talked about how you started getting ready last week. When you first got here, you mentioned USC right away. How much time do you spend during the season, during spring ball, pre?season, all that, thinking about this game? COACH WEIS: I usually spend the pre?season for the most part ?? in training camp I spend for the most part getting ready for the first couple of games early in the year. I think every team's personality changes from the start of the year to the end of the year. So to sit there for a team that you're playing game 12 and spend much time on their personnel or their schemes really doesn't make a whole heck of a lot of sense because teams evolve within a year. Like what you see right now from most teams won't be exactly the same based on a change of personnel, and what they their strengths and weaknesses. I really don't spend a whole heck of a lot of time on teams we play later on in our schedule other than make sure I know what happened last year and make sure that I know what recruits they signed or what change in personnel they have. Like if a guy went out early for the draft, how that affects their depth chart. By the time we play them, usually those things have taken on their own personality and I really don't spend much time on them. Q. Wasn't a point maybe a couple weeks before Army you began peeking ahead to this game? COACH WEIS: Well, see, when you get within striking range of these games, that's a little different because now once you get within three weeks of playing each opponent, looking ?? starting to get preliminary feelings on the personnel of the teams, now their personality has already taken place. I do that all the time. It isn't just with USC. I do that on a regular basis. I did it with Army. I did it with North Carolina. I did it with Air Force. Did it with all of them. Q. Is it harder with the players to take this ?? I know every game is the same, but to take this as the same game as all the others? COACH WEIS: Yes, I'd say that's a fair question because of the magnitude of the game. Besides the fact that it's a big rivalry, the magnitude of the game is so much more. That and the fact that although I've only been here going on my second season, the guys here haven't beaten USC. I mean, you'd like to figure that you walked out of the door having beaten them once. The magnitude of the game, because of the fact that you have two teams with only one loss, combined with the natural rivalry that it already is, combined with the fact that USC has had the best of us recently, it all builds all together. Q. When you were asked about your job here, you always say, I haven't done anything yet. Clearly after two years, you have the team back to where a lot of alumni would like to see it, top 10 for a second straight year. There's been a lot of accomplishments. Do you think the one thing aside from a national championship that you're missing is a (indiscernible) victory? You've had some wins but haven't had that win that everybody says, Wow, that was a great victory? COACH WEIS: There's very few victories that I don't consider great victories. If you glamorize one game, then you're not giving just due to all the other games. There are very few games that we've won that I didn't say, Well, that was a great victory. I mean, we've had two dramatic comebacks this year. I'd say they were great victories. How could you not say that Michigan State and UCLA in the fourth quarter were not great victories? You couldn't feel much better than the euphoria after those two games. Just because it's not USC or Michigan or Ohio State or one of the teams that are considered the creme de la creme, I think there's been some victories here that you couldn't convince our team or players that they weren't great victories. Q. More in terms of you beat Michigan last year, they were No. 3. They end up 7?5. You haven't had the win that people would say, when they're arguing Notre Dame should go to a championship game, they should be in the championship game because of this game? COACH WEIS: I think with all these teams that are trying to put theirself in place to be in the picture, okay, all these one?loss teams that are trying to put their place to be in the picture, I mean, everyone could try to politic and show their bias one way or another. Still the bottom line is there's a blemish on your record. Our blemish was the loss to Michigan at home rather convincingly. Now, the naysayers ?? let's talk the pros and cons. On the one side you have people say, That was in September. They're a lot better team now. If they go into USC and beat them convincingly, shouldn't they come into the conversation? The flipside of that, Well, you had your opportunity. You had your opportunity. You lost a game at home. When I'm so prejudiced and biased toward Notre Dame, why really go there? Every team that has a blemish can sit there and say why they should be in there. The bottom line is, if you wouldn't have lost, you'd be like Ohio State, guaranteed a spot. Ohio State is guaranteed a spot and deservedly so. Q. Coaches a lot of times say it's hard to get teams up emotionally game after game. Do you think right now you have the advantage because this is the game ?? the second Army was over, your team was up there? USC has California, three games in a row, big games for them. COACH WEIS: You have to give Pete a little bit more credit than that. He has his team in position to play for a national championship. This isn't just another game for him. This game is the one that could put him over the hump. I mean, he's really close to Michigan right now in the BCS ratings. If he goes and does a number on us, that might be in your to put him up to two. There's all the motivation in the world for them. There's absolutely zero chance of them coming in flat against us. It's just not happening. Q. When you came in your first press conference, you talked about what kind of team you wanted to have. You talked about having a nasty football team. To what degree have you been able to achieve that level of nastiness? COACH WEIS: Well, I can tell you that I would not trade these guys on this team for another team regardless of record because these guys have lived, endured my personality and the transformation to follow the leader of the head coach, and have done it very professionally, as well. I could tell you that any time you have a team, there's going to be holes in your team, but I really like this team. Therefore, you talk about how happy I am. If I didn't like this team, I wouldn't be very happy about it. Q. But the question still stands. You talked about a level of nastiness. COACH WEIS: I think you watch our team play, as the season has gone on, how they compete week in and week out, how few pitfalls they've had as far as having peaks and valleys, not fighting through it, I think that they've more than passed the test. Q. Is there a limit to that at a place like Notre Dame where the type of student?athlete that you recruit? COACH WEIS: I would hope not. I'd hope not, that you could continue to get high?character guys that were good students that played football at the highest level. Usually the ones that play it at the highest level are guys that compete at the highest level. With that comes a temperament. It's just part of the game. I don't know how many frontline football players you can talk about that have a competitive fire that don't come across with that nasty element that we were talking about. Q. When you first came in, you talked about programs that you looked at, at coaches, how they did things. Pete Carroll was one of the guys that came up. When you were still in the pros, he was in college, did you have contact with him or was this just kind of you were watching him from a distance? COACH WEIS: Pete and I, we knew each other. We were friendly, not friends. He's very close with our special teams coach. They were pretty good friends. 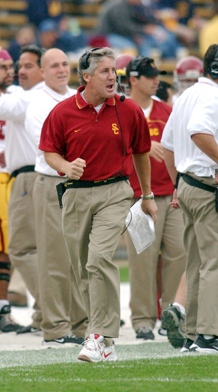 Brad had a very big rooting interest with USC, so therefore I'd follow them. There's only so much college football you can follow when you're coaching in the NFL because usually it's such a time?consuming job, it doesn't leave you a lot of time to sit there and watch football. All I know is the guy, in the last 57 games the guy played, they won 54 of them. You think about what I just said now. 54 out of 57. I mean, three losses by a combined eight points over that span. I mean, if you give me that record right now, I'll take the next four years off, okay? Go ahead, give me that record right now, I'll take a little siesta. Q. One of their players claim that the grass here caused an injury to him. Do you think too much was taken out of it? Are you thinking about the grass height for this game? COACH WEIS: This is the Midwest, okay? In the Midwest, grass doesn't grow as high as it does in the South or in warm?weather climates. Therefore, if you cut the grass low early in the year, usually you have no grass left at the end of the year. I mean, it's pretty simple ?? a pretty simple concept if you think about it. If we go cut the grass low early in the year, it's not going to grow as much, then you're going to be playing on dirt. Because we're not going to field turf here, last I checked, we're going to stay on natural grass, was the grass higher than it will be in a lot of places? Yes. Both teams played on the grass. What difference does it make what field you play on? You play on a field, you play on a field. Q. Your defense, when you look at them, do you feel like there's still a ceiling, there's still another gear they have that maybe we haven't seen to this point? COACH WEIS: Well, you can't really tell because they really weren't threatened very much in the passing game last week. Army was not a team that was really threatening them in the passing game. Now this team, they'll threaten them both in the passing and the run game. When you're going against certain opponents ?? Air Force, predominantly a running team who made some plays in the passing game, but this is a team that can run or throw it. I think therein lies the biggest challenge. The biggest challenge is being able to stop a team that both runs it and throws it at a high level of efficiency. Q. In your observations in practice, that you've seen, your confidence, your feel for your team, do you feel they're ready to step it up to meet that challenge? COACH WEIS: I would say yes. If I said anything else, I'd be stupid. But I would definitely say yes because I think our players are still capable of playing their best game. Hopefully that's the one that comes up this Saturday. Q. Kicking concerns. Do you have any concerns about how that went, given the last couple games? COACH WEIS: There's a couple things. That extra point this week, unlike last week, I can't attribute that one to Carl alone. He had a lot of help on that one. Our kickoffs, we need to improve our kickoffs because that was not ?? our kickoff coverage wasn't so hot either. It all starts with the kick. Is there a concern? Yes. Q. How difficult is it to prepare ?? to go from a team like Army to a team like USC, where obviously there's a significant difference in athleticism that you're dealing with in terms of preparation? COACH WEIS: Mentally it's easy to do. Physically is where it's not easy to do because it's really tough. They have very good team speed, okay? It's really tough to go from the level ?? not to be disrespect actual to Army, but let's use that analogy. To go from the level of athleticism of the Army players to the level of athleticism of the USC players, that is the biggest difference. The preparation will be easy because psychologically and mentally the players are fired up to play. It's easy to do those parts. The mental and psychological parts are easy. It's getting ready for the speed of the game. That is the biggest thing. No matter how hard you try to simulate that, it's just not the same. Q. One of the intriguing aspects of this match?up is the head coaches. What do you recall from going head?to?head as coordinators against Pete back in the day? Could you comment generally, you descend from these very two different distinct and different coaching families. Can you discuss the differences in philosophy? COACH WEIS: First of all, Pete has been a good ?? let's talk about defensive coordinator, because that is ?? the question ?? even though they have a very good defensive coordinator. When he was both the head coach when I went against him and a coordinator when I went against him, but more importantly I think he's been ?? he was one of the better defensive coordinators in the NFL for a while. He's been around for a long time. I remember going against the Jets, watching ?? have Ronnie Lott running all over the place. When they brought him in there from San Francisco... I mean, he's been a good defensive coordinator that has had the guys fired up and ready to go for some time. But what he's really been able to do, even though he had two tours of duty as a head coach in the NFL, he's been able to take that whole level of excitement that he would have as a coordinator and bring it to the entire team at USC. For that I commend him because that's easier said than done. It's one when you only have half the team to worry about to try to get excited to go. You're the one Xing and Oing them. He's been able to do it with the entire team. That and the fact that he's a tireless recruiter, which is probably my biggest complaint. I wish he'd stay home. Every time I'm on the road, there's a handful of guys that are out there either coming right before me, right after me, or right on the same day. Unfortunately, he's one of 'em. He's not willing to rest on his laurels and just sit home and take for granted that, hey, this is USC, you want to come here. He's a very big competitor off the field especially in recruiting as he is on the field. Last but not least, I think whatever tree you come under, like in my case coming under the Parcells/Belichick tree, that's where you're groomed under, therefore you carry a lot of the traits of that tree. I mean, there's more than one way to skin a cat, and I just happen to come under one, he ended up coming under another. I think they both can be very successful. 54 out of 57, 54?3, 57 games, you can sign me up right now. Q. Did you break even or do a little better? COACH WEIS: I don't remember exactly to be honest with you. I'm sure we lost and we won. Q. I think someone asked Coach after the game on Saturday how your defense evolved. I think he used the term "more of a pressure package." Can you talk about how the defense has developed, taken on a new identity or changed its identity over the year? COACH WEIS: I think when you sit in base defense, sit in base defense without mixing it up from coverage to coverage, adding a fair amount of pressure, you play against certain teams that you don't have a physical advantage over, you're just asking for trouble. I think that's the problem that the defensive staff has from week to week. As an offensive play caller, you can dictate the flow of the game because whatever they do, you could force them into doing some things and just hope that they don't do them very well. As the defensive play caller, most defensive play callers just adjust to what the offense does. The really good ones are the ones that say, we're just going to take it to them just like an offensive guy would. I think you need to be able to mix up those two personalities, those two styles of play. I think that lately we've done a little bit of both. That's led to more success. Q. Is that kind of a collaboration between yourself and Rick or that is more Rick? COACH WEIS: What I do is I talk to the defensive staff early in the week and late in the week. Other than that, I watch practice tape and give my thoughts on what I saw. I'll come in and say, Hey, you know, we got to take away their wide receivers. If that isn't a profound statement this week! We don't want Smith, throw Turner in for that matter. Okay, that's Football 101. Now what are you going to do about the rest of the guys? What I do is I'm really big on personnel. That's what I'm really big on, studying team's personnel and saying, Don't let this guy beat us. Then I kind of throw my two cents in of how I think we can do that. They'll pacify me and make sure those calls are in the game plan. Q. The defensive crew that you have had, can you talk about their role? Their tackle production, it's really striking how much more they're involved in those plays. COACH WEIS: It's funny because they play the same amount of plays because they're basically the same guys. Now the thing is they're in the backfield so much more. Both of them had seven tackles last week. Look at Landri's performance. Out of seven tackles, four and a half were for a loss and two sacks. You think about six and a half of your tackles recorded end up being for losses. I mean, that's a good day at the office. Q. Is some of that scheme? Are you able to take advantage of their talent more this year? COACH WEIS: I think they're both very quick players which gives them an opportunity to penetrate and make some plays. Q. Terrail Lambert has some high and low moments this year. Where is he now? The angle, going back to Southern California? COACH WEIS: I've been very pleased with the performance of Lambert over the year. I think every corner gives us some plays, but if you would have said to us ?? if I would have said to you at the start of training camp Lambert is our starting corner, he's going to play pretty solid, you would have looked at me, Lambert, he hasn't been playing here. I say it to you now, yeah, he's had a pretty good year. I think he'll be really excited about going home to play. Q. Back to what you said about being big on personnel, needing to prepare for their wide receivers. Is it something that you would consider or have considered doing this week putting your first time wide receivers up against your first team secondary? COACH WEIS: Not happening. Don't have enough reps in a week. That's why you recruit more than three guys. Put the next set of guys in there, give an 8?1, 2?1, 1?1, then you put them out there, try to get body types that are very similar to those guys, speed very similar to those guys. You have two receivers out of the first three that are 6'5". I don't think Samardzija is going to spend a lot of time being Jarret this week. I think he'll worry about being Samardzija. Q. Would you say October 15th last year is still the sitting moment for these seniors? Last year also you were talking about you needed two weeks to get these guys prepared to think they could beat this team. It's a different mindset this year, I'm guessing. COACH WEIS: I would hope that this year our players are expecting to win versus hoping to win. I would hope that to be the case. Now, of course, that's easier said than done because I'm sure the team we're going against expects to beat us, as well. Look, Pete is 19?0 in November. They've won 32 in a row at home. I think the odds are in their favor the way they're looking at it, okay? For them to go and do what we're counting on doing, they're going to have to play an awfully good game against an awfully good team. Q. Your freshman year was the USC game in 1974. Do you remember much about that, where you were? COACH WEIS: Yeah, I remember ?? the thing I remember the most, besides the green jerseys, okay, which I thought was awesome, that big Trojan horse coming out, I don't know how they got it through the tunnel. I remember that, too. I mean, I don't know how they did it. But the thing I remember the most was us blocking a kick, then there being a penalty on the play, us blocking the very next kick for a touchdown. Did that happen? COACH WEIS: I don't recall that game (laughter). Actually, I was a senior in high school at the time. I do recall missing the second half of that game. I thought the first half was excellent, though (laughter). I'd rather talk about the 77 game. Q. You said the last couple weeks that your players and you are cognizant of this game coming up, but take care of business the week in hand. No more than a minute or two after this game is over on Saturday, your players are chanting, Beat SC. Is there excitement for this game? COACH WEIS: I think every time as soon as a game is over, if I would have gone into the locker room, if they wouldn't have had that share the moment with the fans, as soon as the game was over, when we go in the locker room, I really discuss two things. Whether we win or lose, I discuss the approach with the media, showing respect to your opponent regardless of what happened in the game. That's the first thing I always talk about. Then the second thing I immediately start talking about is getting them focused on the next game because that game is already over. There's nothing you can do about that game. Within the first three minutes of my conversation, those two things are addressed every week. It just so happened they were out there for a half hour, so they beat me to the punch. If we were in the locker room, that chant that was going on in the stadium, that probably would have been going on in the locker room. We were out there for quite some time. They're excited to go out there and have an opportunity to play against a team of this caliber. Q. How much of that do you think is based on what happened last year, what a great game that was? COACH WEIS: I don't think losing last year was any worse than losing the year before, which was any worse than losing the year before. I think losing's always bad. It's never a good thing. I would like to think that for these fourth and fifth?year guys who have never beaten USC, I would like to think they could walk out of here ?? I would hope they could walk out of there saying, Finally we got 'em once. Q. Eight wins in a row. Do you think your team is peaking right now? You've talked about improvement over the last couple weeks. Is Notre Dame playing its best football right now? COACH WEIS: Well, the jury is still out on that one. I'd say we've improved in many areas. All those areas we've improved in are going to have to come to fruition at one time here this Saturday if we're going to have a chance to win this game. Q. You alluded on Sunday to playing a four?corner style in football that you do in basketball when you say a team of the caliber the USC. Pretty much followed it to perfection last year. You had the ball 39 minutes to their 21. I would think that's something you would want any game. How were you able to execute that game plan so well last year to dominate the time of possession? COACH WEIS: The first thing is patience. I think one of the problems that people have regardless of the personnel group or the style of play, that people have when they're going into a big game, is not having patience. I think you need to have patience. Our team has shown that when the game style warrants them playing that way, they could play that way. That's what it was last year. Now, of course, their staff can dictate a different style of play if they care to. You got to be ready to adjust according to what style they're looking for you to play. Like if all of a sudden they're putting 18 people up on the box, they want to sit there and say, We have to shut down corners, they'll shut down Samardzija and McKnight on every play, you have to be willing to take that chance and see what happens. In most cases, good football teams, like USC, okay, make you be patient because when you get impatient, that's why you've seen, as good a team as there's been in the last five years, easily in the second half, they play with so much confidence in the second half because teams become impatient with how things have gone. Next thing you know, USC is up 7, 14, 21, just starts pulling away in the second half. Q. Since USC especially has this tendency, the bigger the game, the more ?? they beat Oregon 35?10, beat Arkansas 55?14, whereas they struggled sometimes with lesser teams. COACH WEIS: But it's like any other team. Getting people up every game... It's impossible to get your team up emotionally high, psychologically high every week. We spent a lot of time trying to address the psychological, motivational, emotional issues. Still the facts are still the facts. When a team is that good and they're playing against a whole string of teams that they believe they're better than, no matter how much coaching you do, sooner or later you're going to have games like that. The difference between them and a lot of other teams is they've been able to, when they have those games, win. Even the one game they lost, the only reason they didn't win it is because they got down by so much, because they made this frantic comeback. Two?point conversion away from the game going to overtime, with all the momentum on their side. You could guess how that one would have ended, too. Q. It was mentioned how it already started on Saturday the beat SC chant. As a coach and staff, how difficult is it in a week like this to get the team not so emotionally peaking early in the week? COACH WEIS: I got that out of the way Sunday. That's one of the reasons why they changed our preparation for Sunday. That's why today's press conference is a question and answer period rather than me going over the state of the union with USC. On Sunday we dealt with the emotional highs and lows, all the trash talking. We got that out of the way on Sunday. I specifically wanted to get it all out of the way. We're not going to come into the USC fight song today, okay? We're not going to put any motivational tools by different announcers across the country. We're coming in, put up the game plan, we're going to go to work. That's what we're going to do today. Q. You talked about USC's success under Pete Carroll. One of the things he's been able to do, he came in, Carson Palmer wins the Heisman, hands off to Matt Leinart. As a guy who knows quarterbacks, how have they been able to do that? How much of that is attributable to the way their offensive line has played consistently overtime? COACH WEIS: Let's start with the quarterbacks. First of all, you have two of the best very best solid quarterbacks playing in the NFL right now. Carson has done a nice job in Cincinnati. Looks like Matt might be the answer in Arizona. That's a very strong statement for both of those guys that were, at the time they walked in there, in need of a frontline quarterback. Moody, he's obviously just getting into the real flow of it now as he's become the guy. I think with their system in place, the system is stable, I think one of the issues you have when systems are not stable, when you're changing from offensive scheme to offensive scheme, what they've been able to do is just bring in guys, plug 'em in. Look at their offensive line. I mean, you lose three or four guys off the offensive line last year, you plug 'em in, let's go. You move one guy over to left tackle, center is your stud, three guys, put them in there. By now they've been starters for a whole year. This is their 11th game now. Isn't like these guys are new starters any more. They've been playing for a whole year already. I think they just do a nice job of taking players, putting them in there, and let's go. A perfect case in point, doesn't have to be the quarterback, doesn't have to be the offensive line, but look at the game last week. Moody goes down. Washington gets banged up a little bit. What are we going to do? We're going to put in another guy, he's going to rush for 91 yards, whatever he rushed for. They just put in another guy, they seem to breed success. You got to give 'em credit for doing that. You got to give 'em credit. Q. As you watch film of Moody compared to Leinart last year, does he seem like he's starting to reach that level of proficiency? COACH WEIS: I think you have to go a long way. Might Leinart was one of the best players coming out of football last year. He was one of the most underappreciated quarterbacks coming out in a long time. This guy can play. I mean, he can play. He can control the line of scrimmage, he can make all the checks. People talk about his arm strength. All I know is I see him completing balls wherever he throws them. Don't underestimate how good Matt was. I think as good as Moody is, as good as he'll become, which I don't know the answer to that, it's tough. It would be like me comparing one of my young guys to Brady Quinn right now. I don't think that would be giving them their just due ?? giving Leinart his just due. Q. Can you talk a bit about the development of Dwayne Jarrett as a big?play receiver. COACH WEIS: It's interesting. When you have tall guys, a guy who is 6'5", 215, and the best way I can relate it to is sort of like when we went to the Jets, Keyshawn was in his second year there. A tall guy, come out of USC, caught a whole bunch of balls, okay? The one thing that Keyshawn always reminded me of is, well, when I worked with him, how he was capable of using his body to get himself open. I think that Jarret, besides being a very good athlete for a guy who is that big, does a very good job at using his body. That's one of the reasons I like Samardzija. I like Samardzija because here is a guy who is 6'5" who does a very good job at torquing his body to be able to be in the right position all the time. I think that's one thing he's been able to do, is take that big frame of his, that size, use it to his advantage, where a lot of people, that becomes a disadvantage. Q. Can you comment on the historical significance of the series between SC and Notre Dame. COACH WEIS: Well, there's been some ebbs and flows in this series. There was that string where Notre Dame won a whole bunch in a row for over a decade. Now USC has gotten the best of us. I think the bottom line is, any time you have an intersectional rival, it's one thing like we play a bunch of teams in the Midwest that are all big rivals, every year they're big rivals because they're within driving distance of each other. We can get to Ann Arbor, East Lansing, West Lafayette. Any time you have an intersectional rival that you play year in and year out like this one right here, it always creates rooting interest just because of the allegiance towards the different parts of the country. I think that's what makes it so special. I'd just like to think that as good as their program has been for quite some time, we're on our way to being on equal footing. I'd like to think we're on our way here. Q. If you go 54?3, would you describe yourself as miserable most of the time? COACH WEIS: I'll be miserable at least three times. I can tell you that (laughter). Q. This week gives you a situation where you probably gotten days of activity to get in in six days. Is that going to work to an advantage in that everybody will be pretty busy, time will fly by? COACH WEIS: We're in really good shape. We are. We're in really good shape because what we were able to do by giving the USC scout report on Sunday, which we normally don't give till Tuesday, that allowed us Sunday night, which normally would be a time when we're doing scouting report, to work on Wednesday night's work because the only ?? what happens is normally on Thursday, which we're going to practice Thursday morning and meet Thursday morning, normally you have that window till the kids get out of school in 2:30 in the afternoon where you can be doing preparation for Thursday. The only time you really lose is Thursday morning. We just have to tack that onto Wednesday night after we're done with practice. In reality, I think the kids are looking forward to practicing today, tomorrow and Thursday morning, putting on the feed bag, going over and having a nice Thanksgiving dinner, then sleeping all the way to California. I think they're looking forward to it. Q. Will there be any late adjustments from Junior? Given you his game plan for the week already? COACH WEIS: Yeah. My cult hero son, yeah. He's reveling. You guys have really made this into a nightmare at my house (laughter). Q. If you were not coaching, broadcasting the game as an analyst, what would you say? COACH WEIS: I'd say if I were looking at it from USC's perspective, this is a game that could help put them over the top, be one step closer to playing for a national championship, if they could soundly beat Notre Dame. I'd say Notre Dame, really you would like to go out there and get this little losing streak out of the way and put themselves in a position to be in a strong BCS game with a very, very longshot of playing for it all. It would only be after an extremely convincing win, which the odds of that happening, being they haven't lost by more than seven but once in that string I was talking about, I'd say you'd need to have a very, very convincing win even to get into the discussion, okay? I think if that ever materialized, sign me up. If that ever did materialize, that would be the only way Notre Dame would get into the discussion because let's be practical. That's just the way it is. Q. With the season winding down, anything about the team surprise you as far as the players go? COACH WEIS: No. I'm proud of this team and happy for this team that they're in the position they're in. I really do believe that it's important to finish the season strong. I don't think you can be content being 10?1, going out to USC, losing there, going into a Bowl game, losing there. That's not what we're looking for. That would not be the way you'd want the season to end. There's still more games left to play. It starts with this one on Saturday. Q. You mentioned early yes about recruiting. Do you personally visit the home of every high school senior that you're recruiting? If so, what's the general atmosphere? Do these kids invite their friends and neighbors over? COACH WEIS: First of all, yes, I do visit every one of them. As a matter of fact, I will not be returning with the team on Saturday night. I'll be staying out there, working my way back east because I'm out there. We'll start on the West Coast and we'll work our way back. I'm only one of several people that does this. I'm very well?received, but that doesn't mean that my presence is going to win out on every kid you end up going into. Q. Is it a family reunion? COACH WEIS: It all depends. There's anything from just a couple people there to everyone within three states all being there at the same time. It's their call when you go make a home visit. I just go there with my same ?? I have a presentation that I do, go that question and answers. It all depends. It's their terms, not mine. Q. What do you like most about your job and what don't you like most? COACH WEIS: I think the thing I like most about my job is it's rewarding to know that in this day of college athletics there is a peaceful coexistence between student and athlete. To have two semesters in a row, the first semester last year they had over a 3.0 grade point average, last semester, a 3.1 grade point average. The fact that you can peacefully coexist, graduate, still play football, I think that probably is the most rewarding thing that I have. Q. What is most disappointing, what don't you like? COACH WEIS: I think the scrutiny that all programs come under. Obviously with the Internet and the media, this is not derogatory towards the Internet or media, it's just the way it is these days. I think the scrutiny sometimes puts undue pressure on the players. I think the coaches have to be ready to roll with the punches because it's part of what they do. You're getting paid good money for it. You have to be ready to roll with the punches. I think sometimes it would be nice if the kids could just be kids, just go ahead and graduate. It just isn't like that any more. You're held accountable. It's one thing me being held accountable for everything I say. They're kids. Things still happen. That's probably the toughest part to watch sometimes, somebody goes out, makes a couple bad plays, everyone alum of the school wants the kid chastised or thrown off the team because he let them down, like they're not trying to win. I mean, everyone's out there trying to win. Q. You've mentioned the streak, losing to them four times in a row a couple of times here. As an alum and a coach, how much does that gnaw at you to have lost to USC four straight times? COACH WEIS: I've only lost to them one straight time. I'm trying not to make it two. I'm not looking at it as an alum. I'm looking at it as the coach. I'm 0?1. I'd prefer not to be 0?2. Ask me this question again Saturday night about 8:30 Pacific (laughter). Q. You talked about going up against Pete several times. Are there 10 nets of a Pete Carroll defense no matter who is playing for him? COACH WEIS: The sad part about it is he knows me, too. It's one thing, yeah, I know Pete. He knows me, too. He knows what I do. These guys are good. These guys know what you do. You're just going to have to do it better than they do it. That's what you're going to have to do. Are they certain things they do year in and year out? Absolutely. There's certain things I do that he knows, too. Sometimes that comes out in the wash. This guy's one of the real challenges. Q. Last week Brady talked about the USC hat that he's kept in his room. Have you talked to him about this game? Does it bother him that he has not beaten USC during his time? COACH WEIS: He was only allowed to discuss that on Sunday. We got it all out on Sunday. We played every song known to mankind. If you would have walked in there on Sunday, it was very enjoyable. We had all the USC songs going. We had media going. We got it all out of the way. Brady is not worrying about hats any more. We're just trying to go out and beat USC, who is one of the best teams in the country. That's what we're trying to do. Q. Brady has had a pretty good year. Compared to last year, some people are saying it's not nearly as good. Do you think some of that could come from maybe some undue expectations put on him at the beginning of the year? COACH WEIS: That's a fair question. I think statistically he's probably as good if not better this year than he was last year. I think any time it's hyped, you're the best player this, you're going to win the Heisman, all that other stuff, because it looks as though it's going in Troy's direction, people look at that like that's being a failure. My answer to that is, let's wait till draft day and see where he ends up that day. Q. With the Heisman expectations that you mentioned, a couple years ago Carson Palmer, people say he secured the Heisman with the game against you guys, Matt Leinart did the same a few years later. Do you think if Brady has a big game against USC, it could work the opposite way? COACH WEIS: I'd like to think so. Watching that game the other day, watching that guy play, look, I'm prejudiced. I'm totally prejudiced towards Brady Quinn. My view is tainted because I really don't know what the description of the Heisman Trophy is. 'Cause to me, who is the most valuable player to their team, who has done more for their team to be in the position like we're in than anyone else in the country, I think that my guy qualifies under that criteria. If the criteria is who is the best player on the best team, well, right now we can't match that. But I'm obviously prejudiced towards Brady Quinn. I think there can't be anyone in the country who means more to their football team than Brady Quinn means to Notre Dame. Q. Could you talk about David Costanzo? COACH WEIS: One of the guys that brings a smile to my face when I think of him. Here is a guy who is out there on a scout team every single day, okay? Not only have I not seen anything but the guy go a hundred percent every day, but he does it with a smile on his face. It's kind of amazing when a guy gets beat uhm some every day. Every time you look at him, he's got a smile on his face. It's kind of refreshing to think that a guy could be having that much fun getting banged around as much as he does. It's fun to watch. Q. What is the ratio of players that attempt to walk on and the ones that actually make the team? COACH WEIS: We try to keep walk?ons on the team just as long as their grades are good and it won't are detrimental to their well?being. If a guy is going to go out there and physically can't hold up, then we're not doing him justice by letting him stay on the team. As long as their grades are good, they're not going to get hurt in a competitive situation in practice, I let them all stay on there. Q. A little cliche, any chance you see of him getting play time down the road? COACH WEIS: Not this week (laughter). Could I see some down the road? Yes, I could see him in a game. Q. All the hype about national championship, BCS, the big game with USC, what have you told your guys this week about embracing that? Do you want them to embrace that or try to block it out or accept it? COACH WEIS: It's easy for us 'cause we're just trying to beat USC. It's not like we're going against some crummy team here at the end of the year, and let's see what happens. We're going to have our hands full just winning this game. To be honest with you, I don't think our players are really worrying about the hype, they're not really worrying about the ramifications. They just want to win this game, okay? That's what they want to do. They want to win this game. Whatever happens happens. I think that's the attitude of the whole team right now. Q. Can you talk about the development of Raymond McKnight this year? COACH WEIS: Raymond is interesting because last year he goes down second game of the year, we're playing Michigan, he's our leading receiver, already caught a touchdown pass, blows out his knee. We go to the medical staff. They say there's a chance we might have him back by USC. I tell the media, everyone thinks I'm lying, but that's really what we thought. Just very slow coming around. Now we get to the off?season. He's working his way into the mix. Then we get to the summertime. Jeff is playing baseball. Now Raymond and Brady are starting to develop a chemistry when they're out there throwing. Then we get to the start of the season where he's still a little nervous about taking those first couple hits because you don't know how it's going to be. I think once he got the cobwebs out, once he got over that initial it's going to be okay to go ahead and get hit, you saw his production skyrocket, whether it's touchdowns, catches, all those other things. It was never a question of whether he could play or not. It's knowing that your knee is going to be okay. Q. Today the Observer ran a story about how 75 members of the band are making the trip to USC at your request. Can you talk about your request, how you hope they will influence the game? COACH WEIS: Actually I tried to get them all to go. At late notice, we couldn't get that many spots in the stadium. I think I was very appreciative of both the band, Father Poorman, everyone involved in getting at least the pep band to go. USC did work with us, come up with 75 spots where we could go. Once again, I was appreciative of both the band and Father Poorman to get that worked out. I'm a big fan of the band personally. I think it's always a positive to have them around. You always can feel them being there. Q. You talked Sunday about trying to get the hype out of the way. How do you separate the students trying to get involved in the players' lives, address that control? COACH WEIS: I don't do that. The only thing we did on Sunday which I thought was very humorous is these guys came into ?? all those songs you hear the USC band playing, they heard 'em. It was loud. I said, Get used to it because you're going to hear it, this is what you're going to hear once you walk into the Coliseum on Saturday. I can't handle all the distractions that happen on campus and everything. I think around here, when these players walk in here a little while from now, it's going to be all business. Q. Can you comment on Carroll Hall trying to change their name to Weis Hall this week? COACH WEIS: I can't show a prejudice towards any specific halls here. I'll get in trouble with a different hall. I'll end up reading about it on SportsCenter. OKLAHOMA CITY -- The replay official for the Oklahoma-Oregon football game says he knew that Oklahoma recovered a pivotal onside kickoff late in the game. But Gordon Riese told The Oklahoman that replay rules prevented him from correcting on-field officials who made the wrong call and awarded possession to Oregon, even though it was clear to Riese that Oklahoma's Allen Patrick had recovered the ball. Riese also said that if he had seen the correct angle of the replay, it would have been easy to reverse the result of the call and give possession to Oklahoma, which could have run out the clock. But that didn't happen, he said, and Oregon took advantage of the officiating blunder, scoring a last-minute touchdown to win 34-33. At the center of the dispute in the Sept. 16 game was a botched call on an onside kickoff by Oregon before the Ducks' winning touchdown. Replays showed the kick was touched by an Oregon player before it traveled the required 10 yards, and, therefore, possession should have been awarded to Oklahoma. The video also showed that Oklahoma's Patrick actually recovered the ball, although that aspect of the play was not reviewable. "This was the easiest call to make, if I'd gotten the [correct] replay," Riese said. "It would have been the right call. It would have been the correct call. The Oregon kid touched the ball at the 44-yard line." Riese said the only replay angle he saw on the play came from Oklahoma's end zone, which he said prevented him from making the correct call. But he did see something else. "I saw the ball laying on the ground, the Oklahoma kid picks up the ball with his knee on the ground," he said. "I knew it was Oklahoma ball." But, Riese said, he chose to follow the rules of the replay system, which meant he couldn't tell the on-field Pacific-10 Conference officials of their error -- even though the referee asked him which team had recovered. "I can't let it go," he said. "It's something we officials have just been schooled with -- to get the call right -- and I didn't do it that day." Oklahoma is 9-2, but would be 10-1 and possibly a part of the national-championship discussion if not for the officiating errors at Oregon. Riese said he's aware of the Sooners' success this season. "Oh, they're a good football team," he said. "My goodness sakes, they're a good football team." The Pac-10 suspended Riese for one game, and he later requested and was granted a leave of absence for the remainder of the season. He said he does not plan to return to the replay booth and that the mistake continues to bother him. "I worry about the screwup we did in the Oklahoma game," he said. "It's inexcusable."